Each year in the fall, the Destination Marketing Association of NC, the state&apos;s trade association for Convention & Visitor Bureaus, hosts an education conference and awards competition. Statewide visitor bureaus submit works in marketing , printing, web based promotions, and tourism initiatives for their prospective communities and based on budget size they are judged by industry professionals. This year&apos;s conference held in Winston-Salem concluded this week, and the Johnston County Visitors Bureau received four Destination Marketing Awards in the small bureau category. "To be recognized by our peers in the state is certainly an honor, and a confirmation for our staff&apos;s hard work promoting Johnston County, " stated Donna Bailey-Taylor, Executive Director. The Johnston County Visitors Bureau is comprised of a staff of five and all marketing campaigns, design, websites, and special projects are handled in-house by the staff. Awards won by the JCVB were; Gold - 301 Endless Yard Sale, Gold - Johnston County Visitors Guide, Platinum - Beer, Wine, Shine Trail brochure, Platinum - Our State Magazine Campaign. Destination Marketing Initiative – Web based, 301 Endless Yard Sale. 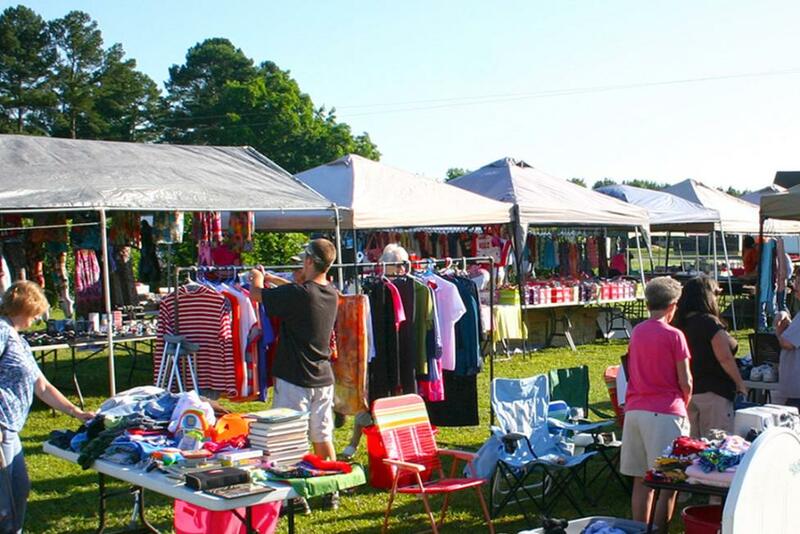 The 2nd Annual 301 Endless Yard Sale was twice as successful in 2014, as it expanded to 100-miles and four counties. This campaign was national in scope and included publicity, website adword campaigns, social, radio, and print advertising. The event FB page grew from 350 likes to over 5,000 during the promotional time frame of Jan-June. The event was expanded this year to a 100-mile yard sale and brought in the CVBs from Halifax, Wilson, and Harnett counties as partners. The organizing committee coordinated the marketing through the JCVB and town officials handled issues like signage, parking, permits, and food vendors. This year&apos;s event had over 500 vendors and more than 5,000 shoppers for the two day sale. Vendors reported high sales, hotels reported overnight stays, and restaurants were very pleased with sales. The Bureau created a website, www.301endlessyardsale.com to be the centerpiece of event marketing; Google Analytics from May-June were 24,155 unique visitors and 90,476 page views. This year&apos;s event included a vendor survey with key results and points noted by the committee were: 35% of vendors heard about the event from WRAL, followed by 30% website, 30% Facebook; 76% of vendors sold on both days with average sales of $500 each day; 81% of vendors found their spot because they knew the property owner; 79% of vendors sold yard sale items, 48% collectibles and 38% antiques; 83% of vendors plan to come back next year. The Johnston County Visitors Guide remains the primary marketing piece for the destination, and the bureau continues to print and distribute 90,000 guides each year. This year&apos;s visitors guide was redesigned to be more of a magazine format, and to cut back on alphabetical phonebook-style listings. Our goal was to tell more stories and share experiences with visitors in the beginning of each section of the guide. In addition, unique landing pages were developed to drive visitors to our websites pertaining to their special interests. The visitors guide is a non-advertising piece that promotes hotels, dining, attractions, outlet shopping, antique shops, specialty retail, festivals/events, meeting venues, sports facilities and transportation services. The main message or purpose of this brochure is to drive visitors to tourism-related businesses, therefore increasing visitor spending in the community. The guide is the fulfillment piece for the bureau’s adverting efforts and is distributed in all NC Welcome Centers, visitor centers and local industry to use while assisting visitors. The piece is highly used by local front desk staff as the most valuable piece the bureau produces. The bureau has now hired a part-time staff person to distribute the guide to over 125 racks around the county to get brochures to all hotels, attractions, key restaurants, and high traffic locations. Niche Marketing Piece – Beer, Wine, Shine Trail Brochure. Three years ago, the Johnston County Visitors Bureau developed the Muscadine Heritage Wine Trail, and since then over 1,000 people have completed the trail. Now with two breweries, and a distillery in the county, we have re-concepted the trail and re-branded the trail to include these new partners. Cost of the trail brochure, $4,500, was completely covered by the six partners and the response from new breweries has been very positive to date as a way for their business to stand out and cross promote with the wineries in the county. The website has an incentive to join our email marketing list, with a monthly drawing for a mason jar mug with a trail graphic logo. Destination Print Advertising – Leisure, Our State Magazine Campaign. This campaign was targeted to individual leisure visitors in the North Carolina market with an added twist for readers to receive a free gift offer. Our State Magazine does not offer reader cards, so our campaign was designed to measure response to the ad in addition to phone inquiries. This print advertising campaign was themed based on the top travel generators for Johnston County -- Fall festivals, Holiday Shopping, History/Civil War events, and Spring Festivals. Each ad campaign had a unique landing page on our www.johnstoncountync.org website, so performance could be tracked, as well as, the request for FREE gift. The tracking methodology was especially telling as to what Our State Readers responded to the most. This type of data on visitor interest is tremendously helpful in planning ad campaigns in the future to deliver content of interest to Our State readers. The response for the FREE gift was consistent throughout the campaign generating approximately 100 requests each. The Johnston County Visitors Bureau is funded by the county-wide 3% room tax paid by visitors to the county. For more information on the bureau&apos;s activities visit the website, www.johnstoncountync.org or call 919-989-8687.